Fashions made by hand in Charlottesville, Virginia for women who care about the fabric they put on their skin, quality that lasts, building community, and effortless beauty. Our mission is to bring fashionable, flattering clothing to those sick of the norm, of never finding a flattering fit, and of boring colors! We will continue to support IRC and train our workers in the best construction techniques and sustainable manufacturing practices. Design your perfect clothing with us and know you're making a difference by doing it. 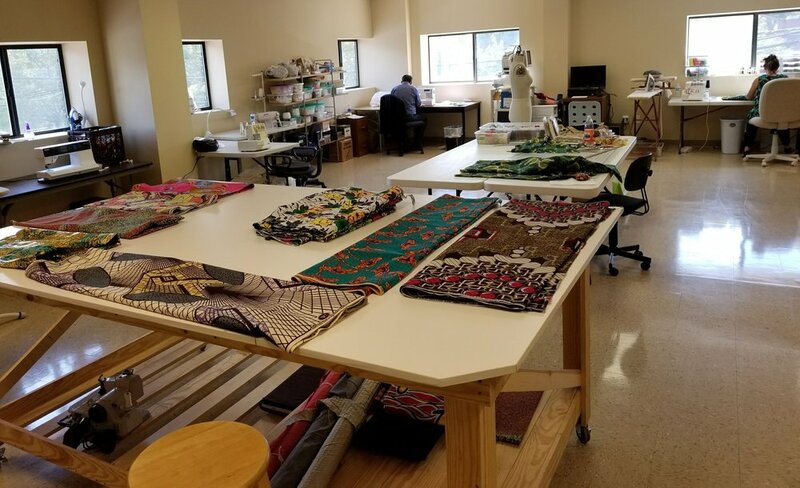 Our garment construction team are former refugees who decided to build their lives in Charlottesville. Our talented co-founder Carla helps them to learn the best techniques for sustainable slow-fashion garment manufacturing. We work locally with the International Rescue Committee, who maintain a vital operation here in Charlottesville. IRC programs are designed to ensure refugees thrive in America. The IRC helps those in need rebuild their lives and regain control of their future in their new home community. We are grateful to these talented people for choosing Charlottesville, and we are also grateful for all the support provided by IRC. Proceeds from purchases of our wristlets go to support IRC. Our collections feature richly colored natural fiber fabrics for sourced from the Netherlands, Paris, Thailand, and other places around the world. Only the finest fabrics are good enough for our customers, and only the most flattering colors make the cut. We measure, cut, and produce our garments by hand so they get the most attention to detail that they possibly can. A dress bought from a fast fashion retailer that focuses on price over quality simply will not last as long or look good for as long as one created with the time and attention that a garment made by a skilled hand will. We use only the finest natural wools, linens, silks, cottons, and blends in the richest colors and neutrals. Inspired by the gorgeous colors of African print cottons, we want all our designs to help you live in gorgeous, lively color. Learn more about the fabrics that inspire our love of color. Our fabrics were chosen for their beautiful and whimsical motifs, and we choose designs that lend themselves well to flattering the feminine physique. The shapes and lines in our fabrics are deliberately aligned with pattern lines to maximize the flattering shapes of our designs. We make 'em like they used to! We curate vintage patterns to create gorgeous, modern dresses and garments using parts of vintage patterns that are most flattering to the modern woman's body. We don't make vintage patterns quite as they were originally written because women are truly shaped differently now than they were generations ago. Work with our fashion experts to create the perfect clothing for your unique body. Our bespoke process will allow you to create a wardrobe that is exactly to your tastes, made to make you look your absolute best.